This year, the Film- und Medienstiftung NRW, in co-operation with the Wim Wenders Stiftung, will award the Wim Wenders Grant to a group of young filmmakers for the second time. The recipients of the grant, endowed with prize money totaling up to 100,000 euros, will be announced on June 2nd in the Filmwerkstatt in Düsseldorf-Flingern, where the Wim Wenders Stiftung maintains its head office on the second floor. The grant is intended to foster talented young filmmakers who possess the vision to tell stories with new means and thus extend our common visual language. The finalists are selected by a jury chaired by Wim Wenders. “Last year’s awarding of the Wim Wenders Grant was already a complete success: the submissions were creative and innovative and the grant recipients presented their ideas with a lot of courage and passion. We are looking forward to this second edition and to new ideas,” says Petra Müller, CEO of the Film- und Medienstiftung NRW. 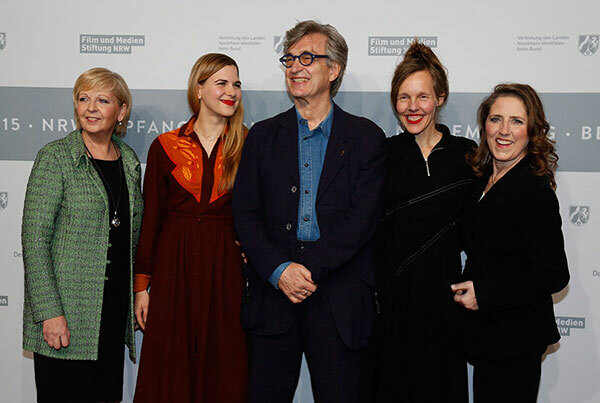 The three-time Oscar nominated director Wim Wenders and his wife, photographer Donata Wenders, founded the Wim Wenders Stiftung in Düsseldorf in 2012, with the support of the Federal State of North Rhine-Westphalia, the City of Düsseldorf, the Film- und Medienstiftung and private donors. In addition to preserving the artistic life’s work of Wim Wenders, the foundation also intends to serve as a platform for exchange and research in the areas of film, art and media and, with the help of the grant awarded by the Filmstiftung, to support innovative cinematic narrative art by young filmmakers and video artists. You can find all information and documentation on the Wim Wenders Grant at www.filmstiftung.de. Applications for the grant can be submitted up until April 20th, 2015.